Twitter's traffic is shooting through the roof right now -- a recent Comscore report finds the site's U.S. usage more than doubled in March, jumping a full 131 percent from the previous month -- and now, the service's founders seem to have some sort of surprise up their sleeves. So what's the big secret? "Tomorrow just became a very big day. (Sorry for the teaser--more later.)" "It's almost midnight in Boston--did I really agree to get up before 6am? Tomorrow is going to be a long and interesting day!" Stone had previously indicated his trip would involve "a few days of meetings." Boston, it's worth noting, is where Twitter investor Spark Capital is based. The company has already invested millions in Twitter, first in 2008 and then again just this past February. One of its partners, Bijan Sabet, writes on his personal blog that the firm's "annual meeting with [its] limited partners" was scheduled for Thursday. So what's the scoop? Is any of this even connected? Is Google actually buying Twitter? Did the company finally fix its server issues and make the fail whale a thing of the past? Okay, so those last two are long shots -- but aside from ruling those out, the real deal is still anyone's guess. One theory, issued by blogger Robert Scoble, suggests the "big day" may about the "Big O." No, not that "big o" -- get your mind out of the gutter, muchacho -- we're talking about Oprah. The queen of all media will send her first tweet tomorrow, Scoble says, and that's what the chit-chat is all about. 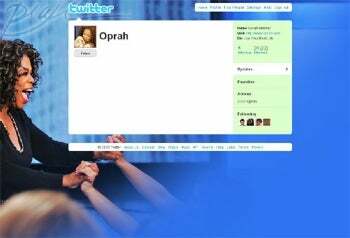 "Everyone knows that tomorrow is Oprah day on Twitter," Scoble states on FriendFeed. "It is the dream of every entrepreneur to be featured on the Oprah show." Well, that makes sense. But if that's the news, and if Oprah's openly discussing it, then why is Williams being so secretive? Seems a little strange. Then again, this could all be much ado about nothing. Stone could be on a standard business trip for some mundane meetings, and Williams could have hired a new nanny. Or purchased a new blender for his office. Hey, the start of unlimited round-the-clock smoothies would be tweet-worthy news for me. Until the big cheese decides to uncloak the big secret, I guess the "big day" will just have to remain a big mystery. If it has anything to do with Oprah or Ashton Kutcher, though, it's going to be one big disappointment. Now, if you'll excuse me, I'm off to go buy myself a big smoothie.